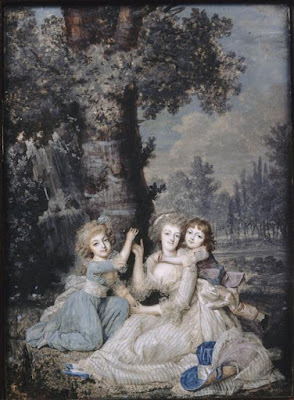 Welcome to a Birthday celebration for Marie Antoinette! was kind enough to host a wonderful soiree that you're sure to enjoy. Please visit her so that you may sashay over to the rest of the participants! Please, EAT CAKE and grab a glass of champagne! If you'll scroll a few posts back (please! ), you'll see I've been working on my boudoir. It is quite inspired by Marie Antoinette; along with other vintage eras. We started working on it last year, ripped out a closet to make room for an armoire; and painted the floor, walls, ceiling, and trim. Still much to do in the decor department. I'll add a few photos here again, so I apologize for those of you who have already viewed them! Now on to something you haven't seen before! This is a fabulous french foot board. I bought the bed at an auction for $15. Termites and/or moisture have taken their tole on the feet. Are you thinking what I'm thinking? I've been wanting to use it for a cornice for quite some time. I just can't make up my mind about the finish. The grain is so beautiful, but the peice needs a lot of work. Plus, I want to somehow make two smaller copies for the other windows. There are just ugly boards trimming out the windows currently, as all the original trim is long gone. 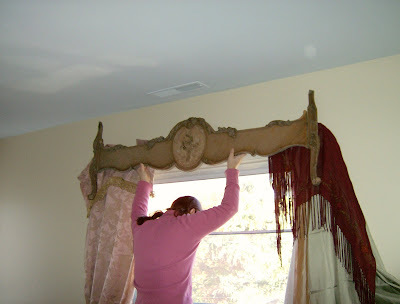 Doing cornices would be easier than putting in all new elaborate trim! 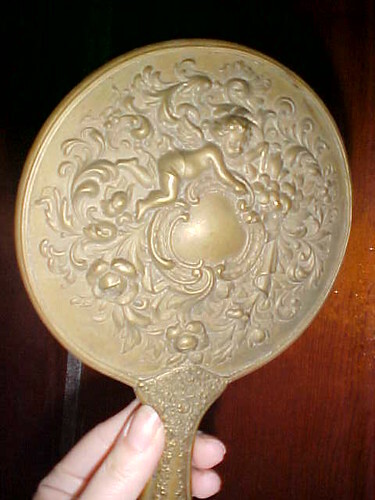 This floral motif is extremely fragile and I'm not sure if I'll be able to save it. If not, I plan to buy an applique to replace it. Click to see detail~ it's a very fine cut vaneer. 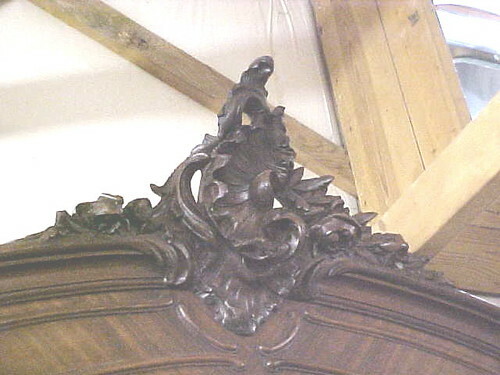 Here is the head board that goes with it. Can't decide what to do with it either. I thought about just changing it out with the gold one when I get bored once in a while. 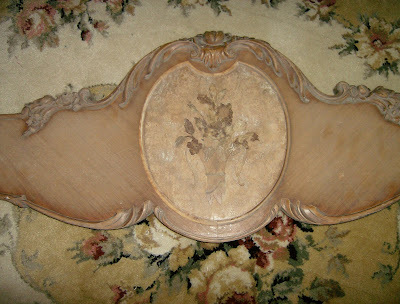 But, while viewing the pic just now I had a revolation that might work.... putting a mirror in the oval part and hanging this above my mantle in the parlor. Hmmm. I'll have to do the measurments to see if that would be a possiblity! This is a lovely print, another auction find. I think it was around $35. 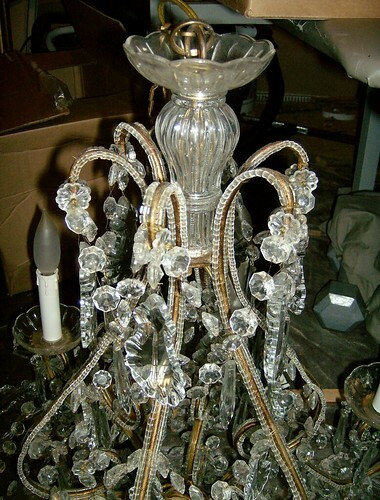 I'm on the prowl for the perfect chandelier sconces to flank the sides! I plan to use this wallpaper border and gold crown molding. I had ordered 6 more of these velvet drapes and they just came in yesterday~ I haven't had time to mess with them. 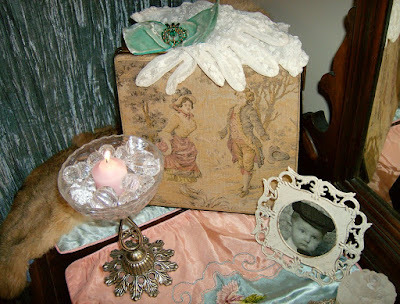 The following are a few random boudoir items, with no place to *go* yet! Hey! There's a before pic of my PINK bike, I didn't think I had one! Woohoo! A $75 auction buy~ I need to revamp this finish somehow without *changing* it. It's worse than it looks. Ok Antoinette lovers... onto some things that are not boudoir related! I wish this pair had a french heel~ but I still LOVE em! These are my wedding shoes. They were black brocade and I covered them with the velvet from my dress. The bows are made of corduroy, also from my dress. Horrid pic, it's an old scan. I looked far and wide for louis heeled shoes and could not find them anywhere at the time. I finally found these (in black) at a thrift store. They were too small and I forced them on like an ugly step-sister, let me tell ya! 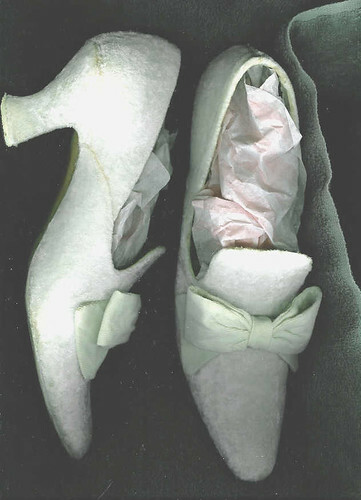 Interested in Marie Antoinette inspired shoes of your own? Perhaps I could help you! Visit my shop at www.scarlettrosegarden.etsy.com! Here's my gown. I designed it and had it made. I wanted victorian, colonial, and civil war influences; I think it turned out quite nice! 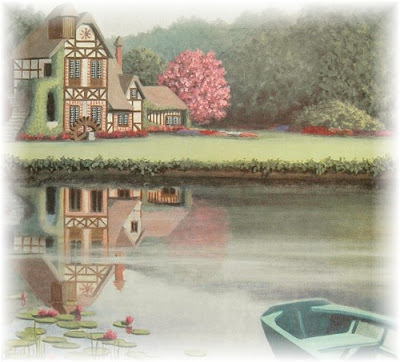 That house in the background is where the french bed came from. We had a contract on it but our inspector told us it had the worse case of termites he had EVER seen, so we passed! I was SO excited when I found that chenille trim that seemed to go so perfectly with the panne velvet and fine wale corduroy. I'm all about texture! 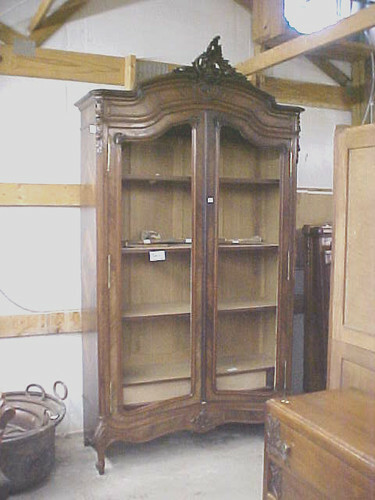 This armoire actually came from France. The mirrors unfortunately didn't make it. I do plan to have beveled mirrors cut, but they are mighty $pricey$. 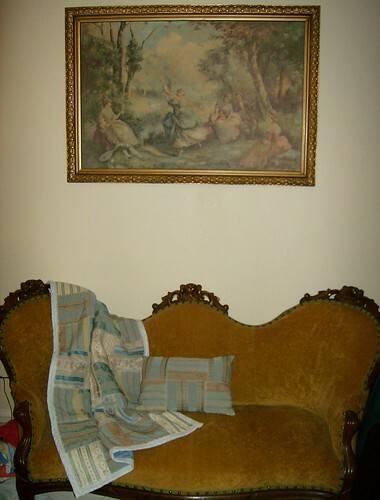 Yet, had the piece arrived with mirrors in tact the selling price would've kept me at bay. I have had people ask me if I'm going to paint this. Um... that would be a NEGATIVE. I'm sure I could go on and on, but you've got other people and places to see! I hope to visit Versailles one day. Your boudoir is coming along nicely. Thanks for sharing about your beautiful weddings shoes and dress. You made a lovely bride! 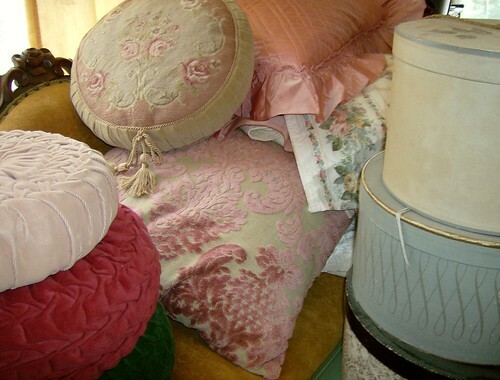 Your love for all things vintage is so evident in everything that you do! 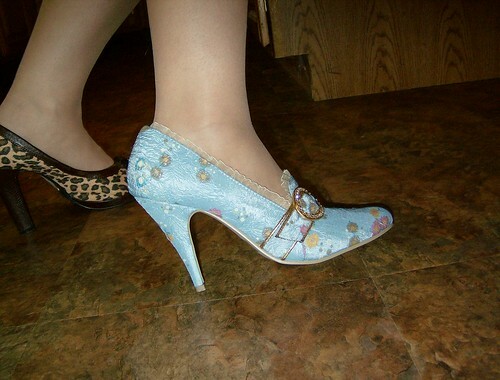 Love the Marie Antoinette heels. I've seen them online and think they are adorable! I had such a wonderful time looking at ALL your wonderful French inspired things! 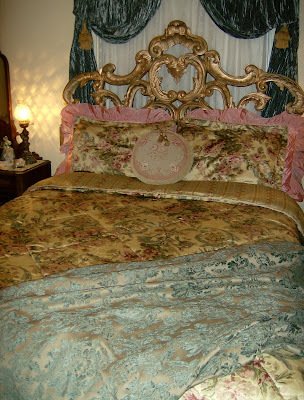 Your bed is fit for a Queen and the footboard for a valance is perfect. 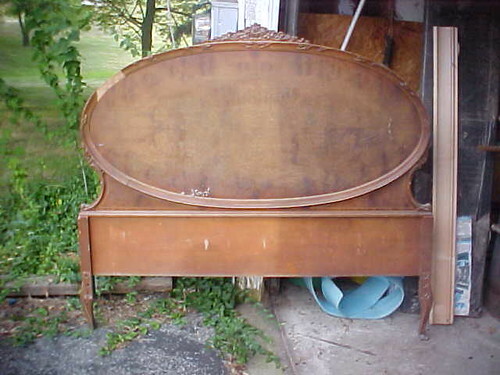 When I saw the headboard that goes with it I instantly thought of a mirror! If too pricey perhaps a painted scene. Thanks for the great tour and your dress & shoes are awesome!! 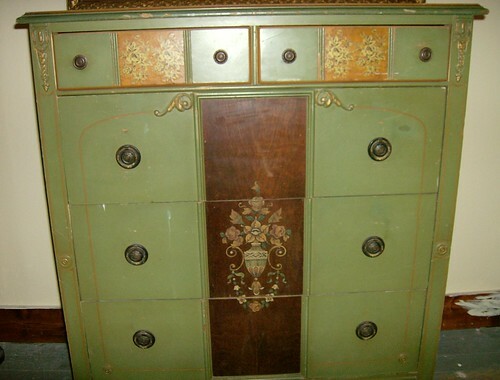 You know I've loved that armoire ever since I saw it in the shop with a SOLD tag!! They don't seem to have more of these antiques. I bought the gate, on the back porch fireplace, there. I went looking in the back room, hoping. But no..none. 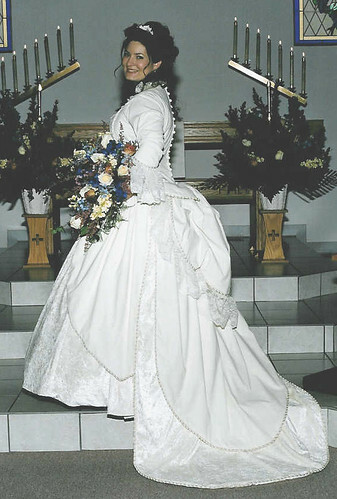 Your gown was gorgeous too!!! I wish you could decorate my hum drum bedroom...inspiring! What a wonderful post full of Marie's style! Loved it! I am losing my head over all your beautiful images! Wow! Your boudoir looks fantastic. What a great post. I have loved visiting your blog! And thanks for showing us the behind the scenes of how you are doing this. The bedroom, the costume, you are all so lovely. Nikki! You are the most fabulously creative person I know! That gown is absolutly to die for and you looked incredible in it! 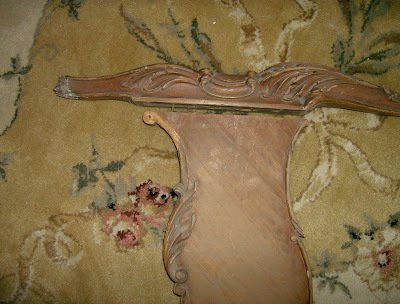 I think the footboard would be great as a cornice! Do it! I have been to Versailles and I'm telling you... you would LOVE it! Wow! This was one of the best posts of the day! Your gown is so delicious and all the work in your home and budoir is spectacular! What a beautiful post... 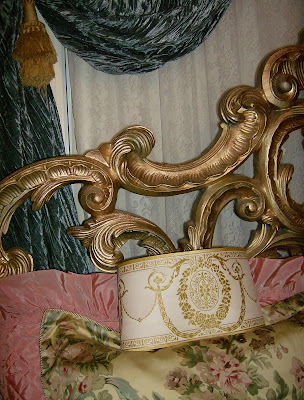 I love the headboard, the cornice- All simply fabulous! And your wedding dress- Simply stunning! Such a lovely, beautiful post. The headboard is to die for. The gown you designed is outstanding. I am so glad I came across your blog. Please have a wonderful and creative new week. Goodness! I don't know where to begin! Such wonderful things. Your wedding shoes, the blue shoes, that rose colored tapestry underneath the french foot board...beautiful! How lovely! Your blog is so romantic and beautiful! very nice blog some how i found you looking for things on our sons birth defect esophageal atresia. Thank you so much for the sweet comments on my blog. I am so thrilled about my new website. I can't wait to get it up and filled with all sorts of pretties. Sign up for my newsletter and I will send you a Grand Opening newsletter. It has been fun getting caught up on your wonderful blog!!! It always lifts me! Congrates on your on going weight lost..you beautiful you! I enjoyed seeing all these pictures! 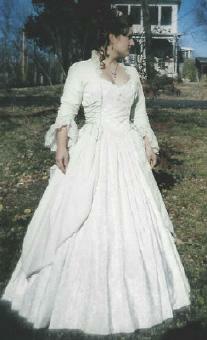 I think you are probably the only person alive who can't wear her wedding gown, because it is too BIG!!! It's usually because it is too small!! LOL! Wow, what an incredible project! How nice it will be when it's finished. 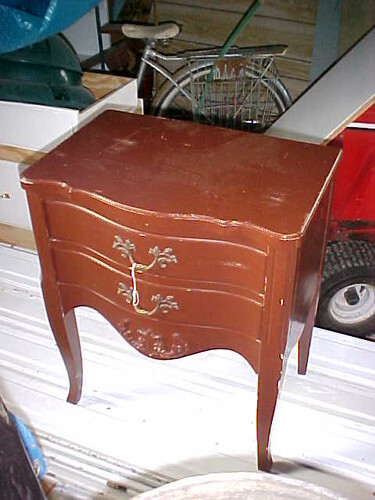 I think it's a clever idea to use the footboard as a cornice. And oh, my your dress is gorgeous!! Good luck, and I can't wait to see it develop! Wow! What a lovely blog you have! Thanks for visiting! Wow, I'm late and everyone else has said it all. Absolutely fabulous !!! what a stunning blog and post! thanks for visiting me during Marie's party! Thanks for stopping by my blog. I just love those blue shoes. So pretty! OOO I really like the headboard- thats really unique! Bedroom looks great- and love the halloween costumes! !!!!!!!!! Beautiful things and great ideas, I love the footboard/cornice! You have such pretty and elegant things!! I enjoyed all the photos! Wow. Loved the whole post! Oh wow Nikki, so many fabulous thing to look at! 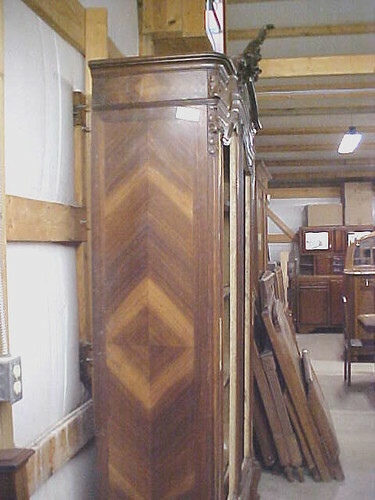 What kind of wood is that armoire made of? Paint it? Yikes, no way! It's just gorgeous. Oh, and your wedding gown, the shoes, oy, everything so beautiful. How long have you been into the whole vintage thing anyway? I don't think I've ever asked you that. The dress, the shoes, the furniture, the accents and the chandelier are all unbelivably beautiful. I can't wait to see what it will all look like when you're finished. I am drooling here! What wonderful finds. You have the eye. Congratulations on your weight loss. I'm righ there with you. I'm working on losing 30 lbs. Your wedding dress is beautiful and how talented you are to have designed it too....you are really gorgeous girl....you know that?! I sure do love that cabinet you found too! I want to go with you to the garage sales, garage sales ar not like the ones you have. You + shoes = perfection... where do you get these beauties? I think you must be Marie Antoinette herself reincarnated. Okay my mind is on overload! So many incredibly gorgeous things and ideas!! Your room is looking SO amazing! And that armoir......the chandy......Oh! I can't take it!!! How do you get so lucky with these finds!?!!? I am drolling and just pea green with envy!! LOL!! 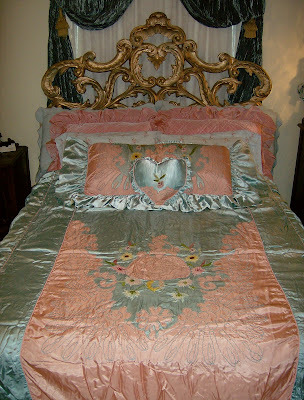 Nikki, you're giving me a serious case of bedroom envy! 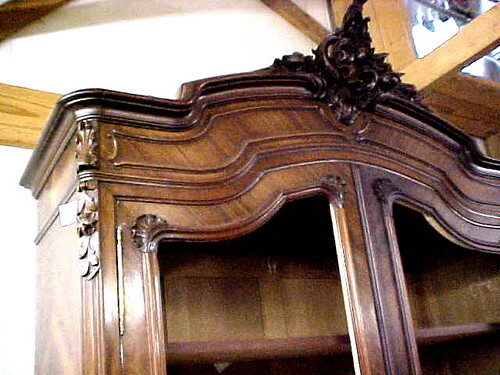 I love French inspired furniture--the cabriole legs is always what gets me. We too are looking to make our place a little more... regal? I'll have to book mark this entry and refer to it once in a while! ;) The whole bedroom series is really quite amazing! I look for things that have that glamour and opulence! India's finest decorative arts for luxury home furniture and interiors. 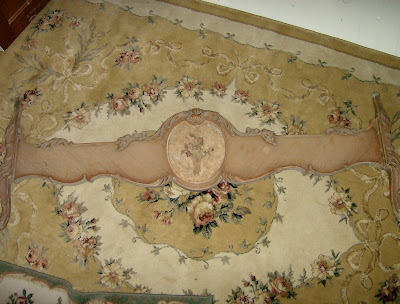 Our collection is custom created for you by our experts. we have a tendency to bring the world's best to our cheap storage units doorstep. welfurn is leading Interior design company that gives exquisite styles excellence in producing and Quality standards. will give door-step delivery and can complete the installation at your home.